The Sewing Room is cleaned up thanks to a little help from my Handsome. I was at a loss to determine how to properly store all of the fabric and decorations that I was trying to house in my Sewing Room. Handsome came up with a few very helpful storage solutions. I'll be sure to post pictures eventually. Now I'm hard at work on a Regency Dress from Janet Arnold's "Patterns of Fashion 1". I'm making the c1798-1805 "Morning Dress" on page 48-49. My dress is an evening dress though, so the pattern will be slightly tweeked to suit the fabric and style needed. The fabric is an Ivory Sheer Silk Organza with Gold embroidered rectangles. Found at the PA Fabric Outlet in Leola, PA for $.99/yd...and I got a 50% employee discount, so it was $.50/yd - score! The Ivory Beaded Silk was purchased on Clearance at JoAnns several years ago. The Ivory Beaded Silk will be the lining for the dress. I considered removing the beads, but they looked so lovely showing through the sheer organza. The above original reminded me of the fabric that I will be using for my reproduction. The dress is to be worn under the Ivory Pearl Beaded Silk Robe c1795-1803 from "Patterns of Fashion 1" page 44-45. I love the way it turned out! I can't wait to make more garments using that pattern. I made the Robe from Ivory Pearl Beaded Silk. First, if you don't like enlarging patterns from grids, the same pattern as the "Patterns of Fashion" Morning Robe c.1798-1805 can be purchased from Reconstructing History. 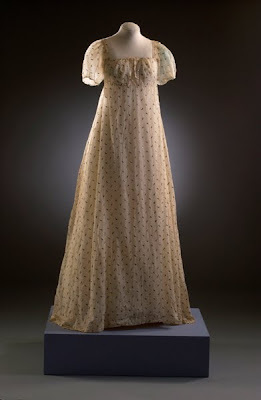 Wearing-History c.1806-09 Dress from "Patterns of Fashion" Reproduction - Very Pretty! And, 'Getting Dressed in 1805' by Koshkacat on Youtube - learn how to put on a drop front regency dress! I'm excited to see it completed. Post pictures of the fabric please! I can't believe you got silk organza at .50 a yard! You lucky, lucky thing! The picture shown is just a picture of a similar original dress, not the same dress from Patterns of Fashion. I'm not sure where I found the image of the dress pictured - I'm so bad at keeping track of those sorts of things. Sorry! Best of luck on your dress! I'm sure it will be lovely! I'm just trying to make my first Regency dress. I don't know really what kind of fabric to use. I'm using a white muslin and a small check cotton fabric for my first try. We are re-enactors but we are always in the woods. The material you named sounds so lovely. I would venture out in a dress like that anywhere.